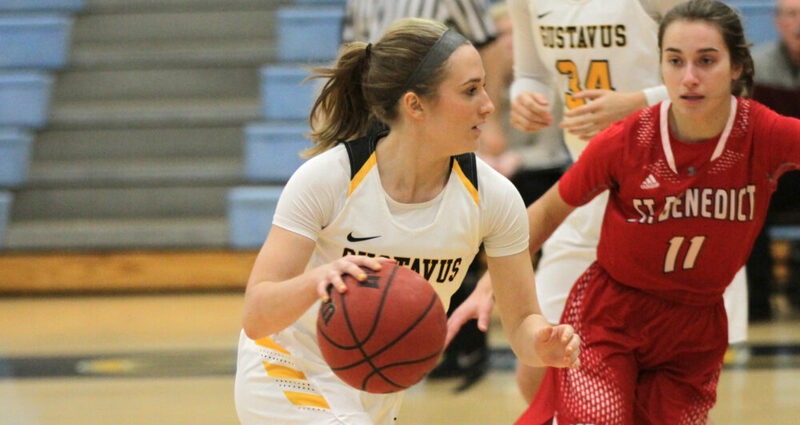 ST. JOSEPH, Minn. – The Gustavus women’s basketball team started its MIAC postseason run Tuesday with a decisive 73-43 quarterfinal win at Saint Benedict. The No. 5 Gusties controlled the boards, doubling up the No. 3 Bennies 46-23, while shooting an efficient 55.2 percent from the field. The Gustie defense was also stingy, holding the home team 28.8 percent shooting. Gustavus’s win avenges two regular season losses to Saint Ben’s and repeats last year’s postseason win at Claire Lynch Hall. Kendall Thompson (Sr., Eden Prairie, Minn.) started the game’s first possession with a jumper and the Gusties led the rest of the way. An 8-2 run midway through the first quarter gave the visitors a 16-7 lead, which increased to 22-10 at the end of the quarter as Alison Hinck (So., White Bear Lake, Minn.) made a fast break layup to beat the buzzer. The two teams traded buckets to start the second quarter before the Gusties scored 13 unanswered points over a five-minute span and carried a 41-18 lead into the locker room at halftime. Gustavus continued to increase its lead in the third quarter, outscoring the Bennies 22-14 in the frame and was able to clear its bench in the fourth with a comfortable advantage. Paige Richert (So., Comfrey, Minn.) led all scorers with 20 points on 9-of-13 shooting and was one rebound shy of a double-double. Thompson finished with 16 points, eight rebounds, and eight assists, while Justine Lee (Sr., Dawson, Minn.) added 13 points and five boards. The Gusties took high percentage shots, outscoring the Bennies 44-10 in the paint. Gustavus advances to the MIAC semifinals where it will travel to No. 1 seed St. Thomas for a 5 p.m. tipoff Thursday. “We can play loose and enjoy the ride,” Kelly said.